I think it would help people to hear more stories about what grad school life is like. People need to know - you're not crazy; it's not just you! As far as bumps in the road, I had a few. Waiting seven years after grad school to get my first research professorship... eight months of unemployment. But I'm living my dream now. Finishing the proposal, getting an agent, and selling my book was an absolutely defining moment for me... While it's a departure from what academia would have me do, it's a return to what I've always felt in my heart. One of the biggest things I learned from grad school was that just because I can do something doesn't mean I should be doing it. This academic path was not even acknowledged where I went to grad school. But it all worked out. Everything I did that I shouldn't have done, that they told me not to do, it all actually led to me being successful on the job market. At the end of the day, we all speak the same language. It's been interesting being a curator; I bring academics to my current institution to speak, and I don't see any gulf between us. The only thing I would say I regret—if anything—is that I wish I could have figured this out a few years faster. It always comes back to this gut feeling that this is my passion, this is my path, and I shouldn't give up on it. I mean, it may not work out, but if it doesn't work out, it's not going to be because I gave up. The best night's sleep I've ever had was the night after I said no to extending the postdoc. It was like, ahhhh; that's the first deep breath I've taken since I was eighteen. I think this career is a great fit for me—though I didn't even know it existed when I was training for it... Actually, it's just the opposite—it's precisely what was missing for me in graduate school, that I ended up turning into an area of expertise. As much as I love my academic work I also enjoy having a creative/intellectual outlet beyond what academia permits... Going outside of academia to television, or to popular books, lets me ask questions in a way that is, comparatively, unrestrained, joyful, and free. Academia is a pretty cool career and yet, I really don't have a ton of desire to go back into it. I'm submitting in two weeks but I don't really believe it. It's like getting out jail. Or more like, they're saying this is when you're going to be released and you kind of won't believe it until it happens. Can I really turn this thing in? 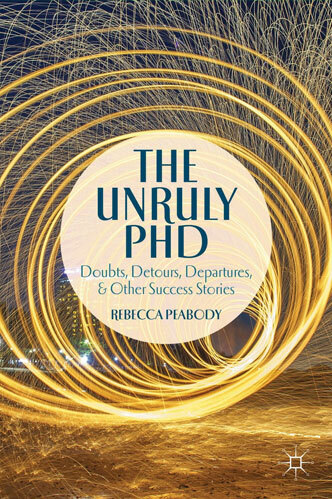 The Unruly PhD is a collection of first-person stories recounted by former graduate students who have successfully reached the other side of a PhD - and are willing to speak frankly about the challenges and decisions they faced along the way. Their stories reveal that many of the difficulties associated with graduate school are institutional rather than personal; that getting sidetracked, detoured and even derailed are the norm, not the exception; and that success is not necessarily tied to the tenure track - or even to completion. Ultimately,The Unruly PhD leaves no doubt that there are as many right ways to get through graduate school as there are students willing to forge their own paths. "I can only hope that when a PhD candidate is in the midst of panic, paralyzing fear, boredom, apathy, or even revulsion, the stories in Peabody's book will come to their mind—in snippets, in remnants, as something they can store away and use. If graduate students could read real-world accounts of not only how to face these trials, but how to face them creatively, this would be a real and empowering thing. Indeed, I would recommend this book to all my graduate students. This is the kind of book one could read at the beginning of the PhD journey as well as at the end." "The Unruly PhD fills a hole in the post-academic career literature with its in-depth first-person essays about surviving the ups and downs of graduate school and the life afterwards. Although many students instinctively turn to the web and blogosphere for guidance and community, navigating the sheer number of narratives can be overwhelming. The book will also be tremendously helpful for friends and family of PhDs to get an inkling about the PhD experience." Rebecca Peabody is Head of Research Projects & Programs at the Getty Research Institute. She earned a PhD from Yale University in 2006, and focuses her research on representations of race, gender, and nationality in twentieth-century American art and culture. In addition to her trade book The Unruly PhD: Doubts, Detours, Departures and Other Success Stories, her scholarly publications include Consuming Stories: Kara Walker and the Imagining of American Race, and the edited or co-edited books Lawrence Alloway, Critic and Curator, Pacific Standard Time: Los Angeles Art 1945 – 1980, and Anglo-American Exchange in Postwar Sculpture 1945-1975. She has taught at Yale University and the University of Southern California. Sign up to receive information related to The Unruly PhD. Thank You! You have been registered for future updates.